t your clients in the long run. By choosing NUDURA, you not only build structures that stand the test of time, you also build a solid reputation for yourself in your market. Today, more and more builders and their clients are discovering the benefits of building with NUDURA. Building owners can get increased durability and fire resistance, enhanced energy-efficiency and comfort as well as additional sound protection. For builders, additional revenue opportunities, enhanced job site control and efficiency as well as lower costs and less call backs make NUDURA an irresistible choice. Our wall system is the new generation of form unit in the world of insulated concrete forms. The system is a stay in place high density polystyrene form. Each form is 12 sq.ft of wall area. Typically our 6" monolithic wall provides an insulation value of R22 and 3 hour fire rating resistance. The thermal performance of the 6" wall is in the order of R50 vs. a stick framed wall. Reinforcement may be placed where needed to satisfy strength requirements for above or below grade load bearing walls, beams, lintels and shear walls. The standard form units have external dimensions of 96" in length and 18" in height with an overall wall thickness of (11 1/2") which in turn encloses a (6 1/4") thick concrete wall. The EPS side of the unit are (2 5/8") in thickness. The EPS thickness is the same for all wall cavities . The polystyrene side panels have a preformed interlocking reversible mechanism along their top and bottom edges to facilitate stacking, providing a solid friction between courses and preventing leakage of freshly placed concrete. Our wall system is proven technology. Similar systems have been used successfully in thousands of projects throughout North America and Europe for more than 30 years. Our wall system is designed for all types of construction. Basement, single dwelling, semi-detached, row housing, low rise, multilevel apartment, commercial, industrial and institutional buildings. Our walls may be finished with stucco, siding or masonry. Special units are available to provide a ledge for masonry construction. Our walls are excellent when used for in ground swimming pool walls, thus resulting in an extended season of use. Our wall system is the informed builder's choice for any well built energy efficient project such as R2000 homes(R22). Our walls offer fire resistance rating (FFR) in the range of 2-5 hours when constructed, depending on wall thickness and the concrete mix design selected. 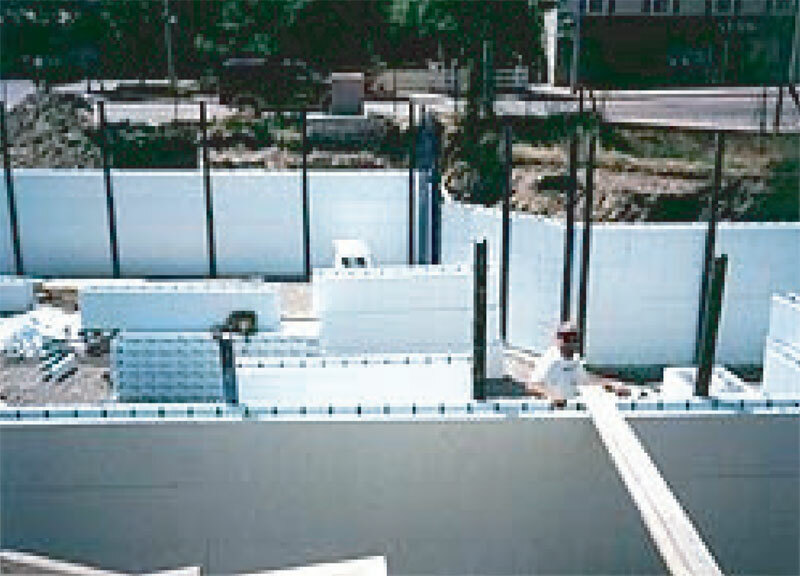 Our wall system incorporates studding insulation, air barrier and vapor barrier. This completed wall assembly is now ready for all mechanical installation. Electrical outlets in exterior walls will not cause air infiltration. Uniform interior surface temperature means greater comfort and energy savings. The high mass of our wall system with the concrete in place provide an excellent sound transmission class (STC) of 50 or greater with the total wall assembly. The manufacturing process dose not use or produce any chlorofluorocarbons (CFC's or HCFC's) The stay in place insulated forms provide the ideal curing environment for the concrete in all weather conditions. This results in a higher concrete strength due to the moist cure. This new generation of ICF is the most advanced state of the art building system in the industry. Pre-assembled folding forms are available in 4,6, 8 and 10 inch cavities. Our patented folding double X reversible, structural plastic web is embedded approximately 1/2" in the EPS panel during molding process. Full height fastening strips on both sides of the form are used for attachment of interior and exterior finishing. Corner forms have continuous fastening strips on each side of the corner. The wall alignment system used to align and plumb the wall also serves as a safe working platform during the construction of the wall. Our forms are easily cut with hand saws, circular saws or other cutting tools to suit the dimension requirements. The unit can also be cut horizontally to offer a 1/2 form for various heights of wall assembly. The reversibility of the form means there is virtually no waste of product. Reinforcement as required is easily installed. Alignment or the rebar is maintained by the notches provided in the web without attachment, thus saving labor cost. Test results and design analysis show that our form units meet and exceed the requirements of the National Building Code, Part 4 and Part 9. Technical data is available upon request. NRC File #9420/03131.